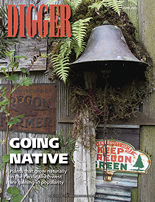 The June issue of Digger has been mailed to subscribers, and the cover story this month is on the increasing popularity of native plants (PDF). Growing native plants makes sense for gardeners since they are adapted to regional soil and climate, need little help to grow well, and they bolster the local ecosystem. “Are you prepared for plant shortages?” (PDF), which provides answers for an industry in search of in-demand plants and new varieties.